This moist, light cake with a delicious caramel fudge type frosting may not take a great picture but the taste is out of this world. A great way to use up more of those overripe bananas!! The bananas should be at least as ripe as in the picture and can even be turning black. Easy to make, the cake part of the recipe is adapted from Company’s Coming’s book Cakes by Jean Pare. The penuche frosting really tastes just like caramel fudge and I could eat it by the spoonfuls. Quite easy to make, it can vary slightly in thickness depending on how long you let the mixture cook and also how long the mixture cools. Simply add a little extra cream – just a small amount at a time – if you can’t beat in all of the icing sugar. If you wish, you can add a teaspoon of vanilla but, after forgetting to add the vanilla, I’ve decided the caramel flavour is more pronounced without it. 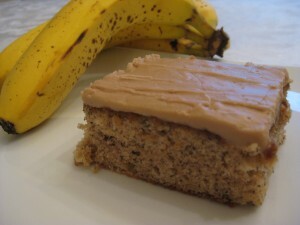 Once you try this cake, you will be letting the bananas go brown on purpose!! This cake stays moist for a day or two – if it lasts that long!! Preheat oven to 350 F. Grease and flour a 9 X 13 pan or 2 – 8 or 9 inch round cake pans. In a bowl, beat the butter and sugar together until creamy with a hand held electric mixer. Add the eggs and beat again until well blended. Add vanilla. Mix banana and buttermilk in separate bowl or glass measuring cup. In a separate bowl, stir or sift together flour, baking powder, baking soda, and salt. Add dry ingredients to butter mixture alternately with banana mixture (3 flour/2 banana) beginning and ending with flour. Do not overbeat. Spread in 2 greased and floured 8 inch pans or one 9 x 13 pan. Bake for 30 to 40 minutes (depending on pan size) or until a toothpick comes out clean. Let cool on a rack for about 10 minutes. Turn out onto rack to cool completely. Melt butter; add brown sugar and cream. Bring to boiling; reduce heat slightly to prevent burning and boil mixture for 1 minute, stirring constantly. Immediately remove from heat and pour into heatproof mixing bowl. Let cool to lukewarm. With electric mixer, beat in approximately 3 cups icing sugar to desired consistency. Add a little extra cream if necessary. Frost cake immediately as the icing sets quickly. Makes enough to frost top and sides of 8 inch layer cake and more than enough to frost a 9 x 13 cake. Note: 2/3 of the frosting recipe is about right for the 9 x 13 cake – 1/3 cup butter, 2/3 cup brown sugar, 3 tbsp. cream and approximately 2 cups icing sugar.